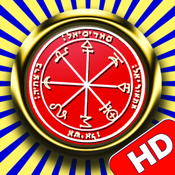 "Solomon seals" is an app which provides a series of ancient secret seals which can help in life on various subjects. The app has 4 categories, which are: Love, Money, Health and ‘special’ category. What is the "King Solomon Seal" ? with mystical combinations with different letters. With the help of the seal, King Solomon helped people, was protected from harm, brought relief to patients, acquired wealth, happiness, relationships, love and more. Combinations of signs and letters that engraved on the "Seal of Solomon" apparently inspired by Kabbalah names, names of angels, biblical verses and different codes, which are intended to protect its carrier in various aspects of life. 1. Enter one of four categories and choose the seal of your desire. 3. If you want to choose it as your seal and to achieve it’s power of change tap the ‘save’ button. 4. Press the home button to close King Solomon's seals, than open 'Settings' to set your King Solomon's seal as your iPhone background. Notice: After achieving desired effect you should remove it from your iPhone background.